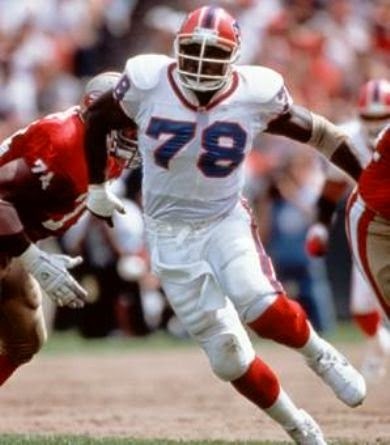 The first overall pick by the Bills in the 1985 NFL draft, Smith started off slowly as a rookie with a poor team but broke out with 15 sacks in 1986 and earned both consensus first-team All-NFL and Pro Bowl honors for the first time in ’87. Strong against both the run and pass, he benefited from the arrival of LB Cornelius Bennett and other defensive stars. Smith was again a first-team All-NFL choice in 1988 and ’90 as well as a Pro Bowl selection in each year from 1987 to ’90, and was the Associated Press NFL Defensive Player of the Year in 1990 as well. A knee injury limited Smith to just five games in 1991, but he bounced back in ’92 to record 14 sacks and return to the Pro Bowl for the first of seven consecutive seasons. He was also a consensus first-team All-NFL selection in 1993 to ’95. Bills went 10-6 to finish second in the AFC East and qualify for the postseason as a Wild Card entry. Lost AFC Wild Card playoff to Jacksonville Jaguars (30-27). Smith was a consensus first-team All-NFL and Pro Bowl selection again in 1997, a year in which he registered 14 sacks, and he was named to one more Pro Bowl with the Bills in ’98. After 15 years with Buffalo, Smith moved on to the Washington Redskins in 2000 and had his last double-digit sack season, with 10. He hung on until 2003, finishing up as the NFL’s all-time leader in sacks with 200. A great all-around defensive end with tremendous savvy as well as speed and strength, Smith played in a total of 279 games, was a consensus first-team All-NFL selection eight times and a Pro Bowl choice on 11 occasions. He was inducted into the Pro Football Hall of Fame, Class of 2009.